GraphicsOne announces two large format industrial strength heat presses - the GO xPress 4060 and GO xPress 4080. 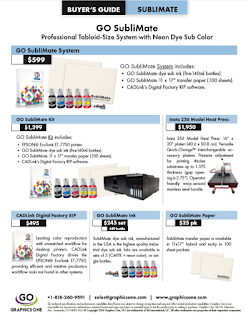 The GO xPress 4060 and the GO xPress 4080 are high performance pneumatic heat press systems with significant working space for transferring high quality images onto a variety of substrates with ease. The xPress 4060 and the xPress 4080 combine heavy-duty industrial grade steel frames with precise and easy to use electronics providing the best possible features for a variety of heat transfer applications. Additionally, avoiding timing errors with the automatic timer releasing the press when the preset timer is complete.